This is Part Four of my story. I actually get energized by figuring out how to do something new or difficult. So, I approached going gluten free like it was a mountain to climb or a puzzle to solve. The day after I got my test results, I headed to the grocery store to tackle this thing head on. I would find out what this gluten free world was all about. I would take it by storm. And I would win. I stood in the baking goods aisle, carefully reading the labels on all the different types of gluten free flours and bread mixes. A two pound bag of flour was $8. It was already hard enough planning meals, shopping and budgeting for our family of six. How would this ever work? I was overwhelmed and sad. Why was this happening to me? I stared at the grocery shelves and cried. The first few months were actually a period of mourning for me. I kept a running tally in my brain of the foods I would never eat again. Each time I thought of something I would never eat again, I would add it to my mental list. Then, I would try to recite the whole list in my head. Often, I would just have to pause for a moment of silence to commemorate the foods that were forever banished from my body. Sadness. I quickly discovered all of the gluten free replacements. But for the most part, I opted for substitutions, rather than eating commercially-prepared gluten free items. I would eat corn tortillas instead of bread. Potatoes or rice as a side dish, rather than pasta. I got the hang of it quickly and learned to function without gluten. That doesn’t mean I enjoyed it. I had gotten a really good grip on my inner sugar monster the spring before I found out I had celiac disease. Now, it was back with a vengeance. I made no attempt to try to curb my cravings. If I couldn’t have pasta, bread and cereal, then I deserved to have all of the candy bars and Chunky Monkey ice cream that I wanted! I read every label, and if it said gluten free, that was all that mattered. I gained about seven pounds in seven months before I decided that maybe I needed to re-evaluate. I will end this post with a few thoughts about gluten now that I’m almost a year into this journey. Despite my own struggle with going gluten free initially, I wouldn’t ever go back to eating gluten even if I had a choice. I have learned so much about this hidden substance and how it impacts our health. Even if you aren’t sensitive to gluten or intolerant because of an allergy or autoimmune disease, gluten is not good for you. It is one of the main sources of inflammation throughout your body. Doctors now believe it contributes to inflammation in the brain, which leads to Alzheimer’s Disease. It can cause inflammation in your joints, which leads to rheumatoid arthritis. I’ve read that gluten can contribute to infertility and even slow growth in kids. Since I started writing these blog posts a few months ago, both my husband and oldest son have stopped eating gluten. (The other three members of our family have reduced their intake substantially.) Both of them have experienced great health benefits, despite the fact they haven’t been diagnosed with any type of allergy or sensitivity. If you experience issues with bloating, digestive problems, joint swelling, insomnia, brain fog, or skin issues of any kind, try going without gluten for 30 days. 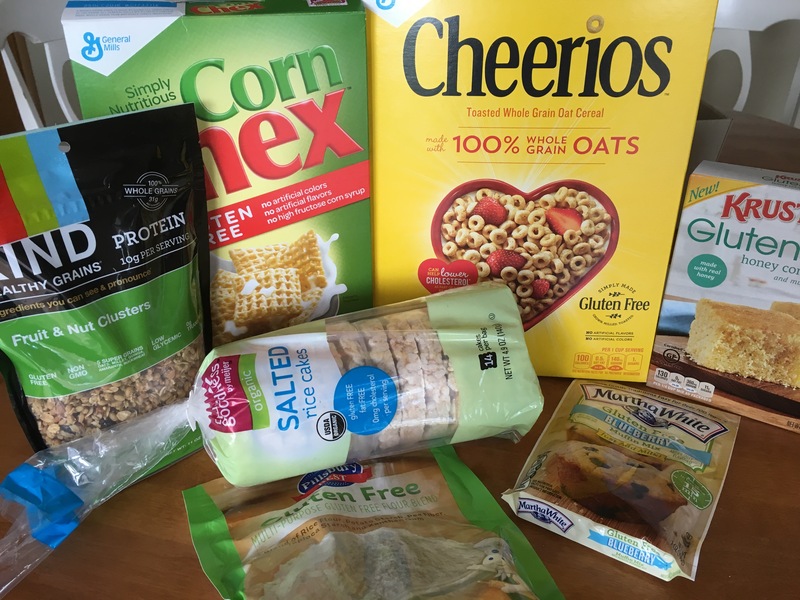 If you are wondering about the cost of going gluten free, we rarely buy products that are labeled “gluten free.” We only buy limited amounts of gluten free bread or crackers or flour. Instead, we eat real food that wouldn’t contain gluten in the first place. We eat sweet potatoes, cauliflower rice and lots of veggies. The kids eat corn tortillas, rice cakes or Cheerios. Like me, it seems most people love their gluten. It’s basically the last thing anyone wants to give up. In his book, “The Grain Brain,” Dr. David Perlmutter calls wheat and gluten “the cigarettes of our generation.” Women have told me how relieved they are that they don’t have to be gluten free. I will tell you to give it a try. Looking back, I’m actually glad I didn’t have a choice other than to go gluten free. I don’t think I would have done it I didn’t have celiac disease. Eleven months later, I don’t have any desire to eat foods containing gluten. Eliminating those foods was a difficult transition, but it was worth it. I’m super thankful to be free of the desire to eat bread and baked goods, and I feel much better without being weighed down by gluten. You are a wonderful writer. I can really see and feel your journey. Thanks so much for reading, Al! I really appreciate it!